Ivanka Trump is heading back to school! The mum-of-three revealed earlier this week that she will be taking a coding class with her five-year-old daughter Arabella Kushner. "As a mom, I am trying to do my part, as well. My daughter, Arabella, and I are enrolling in a coding class this summer," the first daughter told middle school students at an event celebrating the important role of women and girls in STEM held at D.C.'s Smithsonian's National Air and Space Museum. She added: "We're excited to learn this incredibly important new language together. Coding truly is the language of the future." Ivanka's upcoming class won’t be the only thing keeping her busy this summer. It was announced on Wednesday that the busineswoman will be officially joining her father, President Donald Trump's administration as an unpaid employee. The White House said in a statement: "We are pleased that Ivanka Trump has chosen to take this step in her unprecedented role as first daughter and in support of the President." GALLERY: Inside Ivanka Trump's family life in D.C.
Ivanka also released her own statement addressing concerns over her new West Wing position. "I have heard the concerns some have with my advising the President in my personal capacity while voluntarily complying with all ethics rules and I will instead serve as an unpaid employee in the White House Office, subject to all of the same rules as other federal employees," she said. "Throughout this process I have been working closely and in good faith with the White House Counsel and my personal counsel to address the unprecedented nature of my role." Prior to her father's inauguration in January, Ivanka stepped down from her family’s business and own company. At the time, while announcing her family’s move to D.C., the 35-year-old noted: "I plan to take time to settle our three young children into their new home and schools." Ivanka and her three kids appear to have settled into their new life in the nation’s capital nicely. 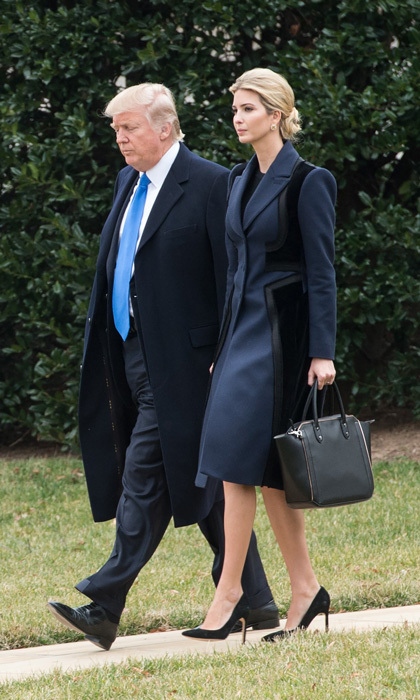 The businesswoman often shares snapshots of her children visiting various D.C. museums and paying visits to their grandfather’s new residence, the White House.